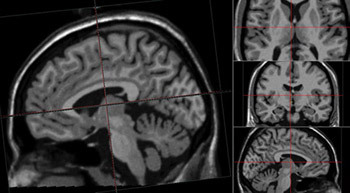 Our research aims to enhance the effectiveness of DBS. This includes fine tuning existing therapies and exploring new brain targets and stimulation strategies. Pedunculopontine nucleus DBS is a promising new treatment for gait freezing and postural instability (poor balance) in Parkinson’s disease. However, so far, the impact of PPN DBS is very variable. We are refining the clinical method of PPN DBS to improve its effectiveness – by identifying which patients are likely to respond and the ideal location to implant electrodes. Currently, DBS is ‘open loop’ - stimulation is set at the same level regardless of what the patient is doing. This means that at any particular moment, stimulation may be excessive or insufficient, resulting in side effects or incomplete benefit. We are therefore investigating ‘closed loop’ stimulation – where DBS is applied according to need, triggered by brain signal that reflect disease severity. This requires a sophisticated device to sense these signals and deliver stimulation at high resolution. This may be achieved by the advanced electronics used in Cochlear stimulators. A further advantage of Cochlear devices is their small size, which may allow implantation directly in the skull bone rather than in the chest wall. DBS for dystonia can transform quality of life. However, the impact of DBS on dystonia is highly variable. We seek to clarify why this occurs. 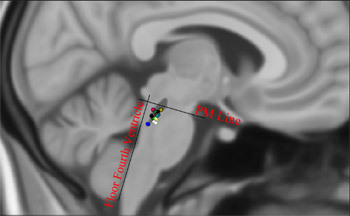 One focus has been the precise location of electrodes within the chosen brain target (the globus pallidus interna). Our preliminary results suggest that this has a substantial impact. 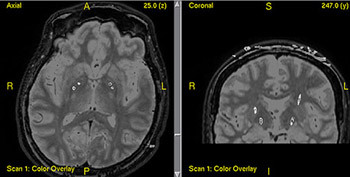 Furthermore, that outcomes may be improved by employing novel patterns of stimulation to steer DBS, by relocating electrodes or by adding a second pair of electrodes. For many patients with epilepsy, their seizures are not controlled by medication and they are unsuitable or have failed conventional surgery. For these patients, DBS may help. In a collaboration between major epilepsy units in Melbourne (at RMH, St Vincents and the Austin), we are assessing which patients with epilepsy are likely to respond to DBS – and how to tailor the choice of brain target to the individual. Journal of Neurology, Neurosurgery & Psychiatry, 2011 May;82(5):569-73. Thevathasan W, Mazzone P, Jha A, Djamshidian A, Dileone, M, Di Lazzaro V, Brown P.
Sauleau P, Eusebio A, Thevathasan W, Yarrow K, Pogosyan A, Zrinzo L, Ashkan K, Aziz T, Vandenberghe W, Nuttin B, Brown P.
Involvement of the Subthalamic Nucleus in engagement with behaviourally relevant stimuli.